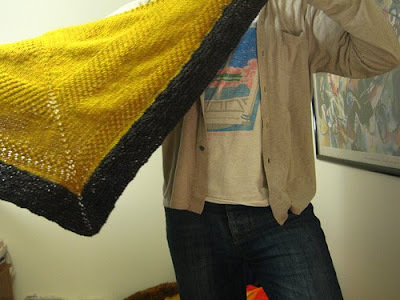 I had a lot of fun knitting this textured shawl recipe by orlane over on Ravelry. 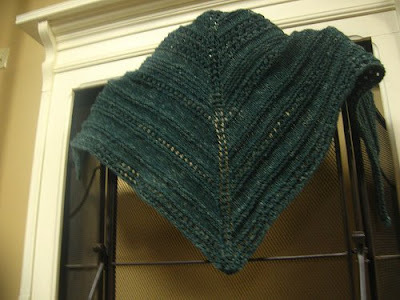 It is just a normal triangular shawl, two garter stitches on each side and left/right increases instead of yarn overs. 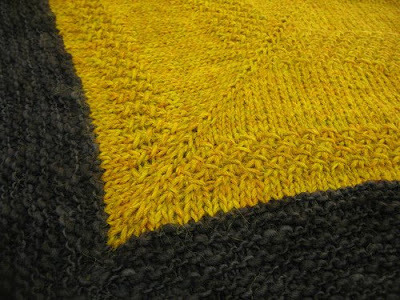 The textured stitch pattern was extremely easy and adds a lot to the shawl. I made my first shawl a few months ago for my mom that used garter and stockinette stitch and some yarn over rows. 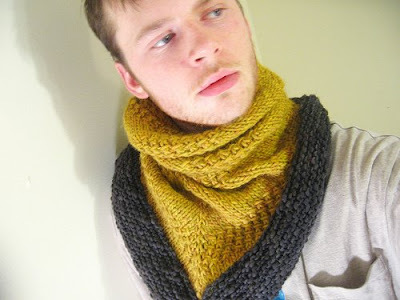 I like the simplicity of these triangular knits and the stitch variations that make them interesting. 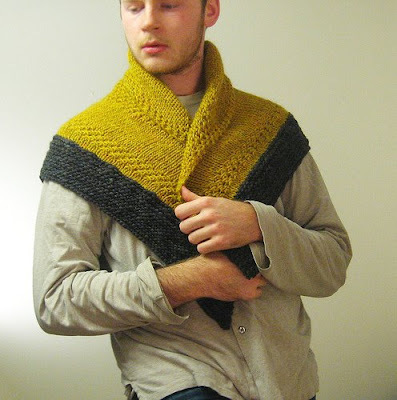 The last picture is a variation of the Simple Yet Effective Shawl by cosmicpluto. Both yarns were so nice to work with. I love the colors in Cascade Pastaza, especially this heathered mustardy yellow. It makes an even dense fabric that gives the piece good drape. The charcoal Jewel Hand Dyed is very interesting with its light and dark shades gray. It's a squishy thick & thin yarn. I only had to use two skeins of Pastaza and one of the Hand Dyed. I have figured out a few ways to wear this shawl and it is very warm so that's good for these cold winter days. I have scarves and other things for my neck too, but I wanted to make a shawl anyway. I had just enough yarn and when I don't wear it, I like looking at the wonderful fabric hanging in my room. I just started another triangular shawl in stockinette stitch with several garter ridges in a gray tweed. They are so easy and enjoyable to knit and make great FO's. That looks great, you can't go wrong with the yellow and grey combo! I've just found your blog through ravelry and I've really enjoyed reading your posts. In them it seams so easy to knit a pullover...congratulations, you are doing a great work! Love the simplicity of the knit, paired with a yummy colour combo equals one awesome knit! great blog. just added you to my 'comrades in yarn' list. 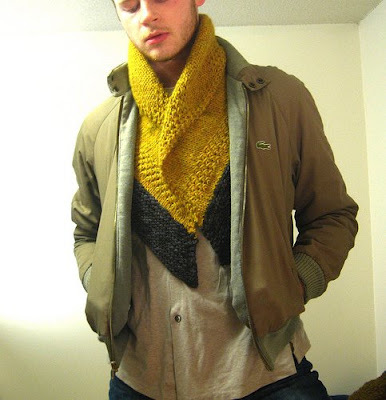 Your textured shawl looks great. I recently made one too inspired by yours and other ones I've seen around the web.